Are there any authors on your TBR that you just can’t believe you haven’t read yet? That’s how I feel about Lisa Unger. I’ve been fortunate enough to meet Lisa at a number of crime fiction conferences now; I’ve heard her speak on panels, I’ve read glowing reviews of her books, and I’ve listened to some of my best bookish friends rave about her work, too. So when I discovered that Lisa would also be at this year’s Bouchercon conference, I knew it was the perfect time to learn a bit more about her work—and to finally put one of her books on my fall reading list, too! I had an absolute blast chatting with Lisa about all things crime writing at Bouchercon, and I’m so excited to share our conversation with CBTB readers today. If you haven’t yet read Lisa Unger, consider this your “Lisa Unger 101” - and if you’re already one of Lisa’s myriad fans, consider this your chance to get a little behind-the-scenes glimpse into the writing life of one of America’s foremost female crime writers. A.J. Finn’s Hitchcockian thriller THE WOMAN IN THE WINDOW has taken the book world by storm, debuting at #1 on the New York Times bestseller list and earning rave reviews from critics and readers across the country - and this week, I had the chance to sit down with him and talk crime writing, psychological thrillers, Hitchcock films, and a whole lot more! This was an incredible opportunity to learn about one of the hottest crime books in the world right now with its author, and I’m thrilled to share our conversation with you today. Happy publication day to THE CHALK MAN by C.J. Tudor, an exceptional debut thriller that is bound to be one of my favorites of 2018! THE CHALK MAN is poised to be an instant-favorite for fans of Stephen King, Stranger Things, and psychological thrillers with the rich character development of Liz Nugent and engaging plotting of Ruth Ware. C.J. visited New York this fall, and I had the chance to sit down with her and ask her a few of my most pressing questions about THE CHALK MAN - and I’m delighted to share our interview with you today! Today (12/5/17) is the US publication day for NIGHTBLIND, book two in Ragnar Jonasson’s brilliant Dark Iceland series! The Dark Iceland books have been a personal favorite of mine for quite a while now, and I’m thrilled to see this exceptional series releasing in the US. 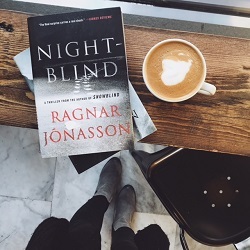 If you’re a newcomer to the Dark Iceland books, you’ve come to the right place: I’m delighted to have Ragnar Jonasson joining me on CBTB today to chat about his unmissable crime fiction series, and its newest installment: NIGHTBLIND. Every reader has that dream list of favorite authors they would love to meet; for me, one of the people at the top of my list is M.J. Arlidge, author of the DI Helen Grace series. While in Scotland for the Bloody Scotland crime festival, I had the fantastic chance to sit down with Arlidge and interview him about the Helen Grace series as a whole, and HIDE AND SEEK in particular! I'm thrilled to share this interview as part of the Graceland Blog Tour, a week spent exploring the world of Helen Grace, one book at a time.